The Bentley London is discreetly hidden in the quiet residential area of the Royal Borough of Kensington and Chelsea. This grand 19th century, five-star hotel’s interior exudes grandeur and opulence using the finest marble, silks, and antiques to fuse elegant style with impeccable comfort. With 64 luxuriously decorated guestrooms, a brasserie offering traditional English Afternoon Tea, cocktail lounge, and rejuvenating spa, this historic hotel is the perfect choice for the upscale London business and leisure traveler. Located in the heart of London's Kensington district, the Bentley London is moments away from exclusive shopping at Sloane Street and Chelsea’s Kings Road along with internationally renowned Harrods in Knightsbridge. Nearby notable cultural attractions include Kensington Palace, the Victoria and Albert Museum, the Natural History Museum, and the Science Museum. 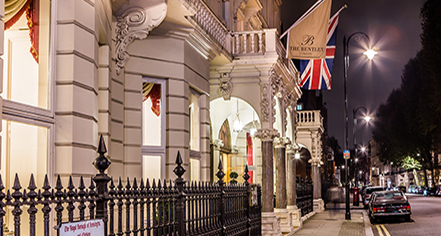 The Bentley London, a member of Historic Hotels Worldwide since 2016, dates back to 1880. 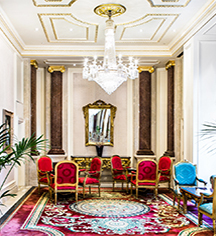 The Bentley London lavishly incorporates 600 tons of marble imported from Turkey, Italy, and northern Africa, with intricate mosaic designs throughout the hotel. Accessible Rooms: Handicap accessible rooms are available. Please notify request at time of booking. Cribs and Pack-in-Plays: Available upon request. Parking: On-site parking: Not Available..
Payment: All forms of payment are accepted. Payment is required at time of booking. Visa, MasterCard, Amex, Diners Club, and JCB are accepted. Pet Policy: Service animals allowed: Please contact hotel. Pets allowed: No. The Bentley London is discreetly hidden in the quiet residential area of the Royal Borough of Kensington and Chelsea. This grand 19th century, five-star hotel’s interior exudes grandeur and opulence using the finest marble, silks, and antiques to fuse elegant style with impeccable comfort. Learn more about the History of The Bentley London .